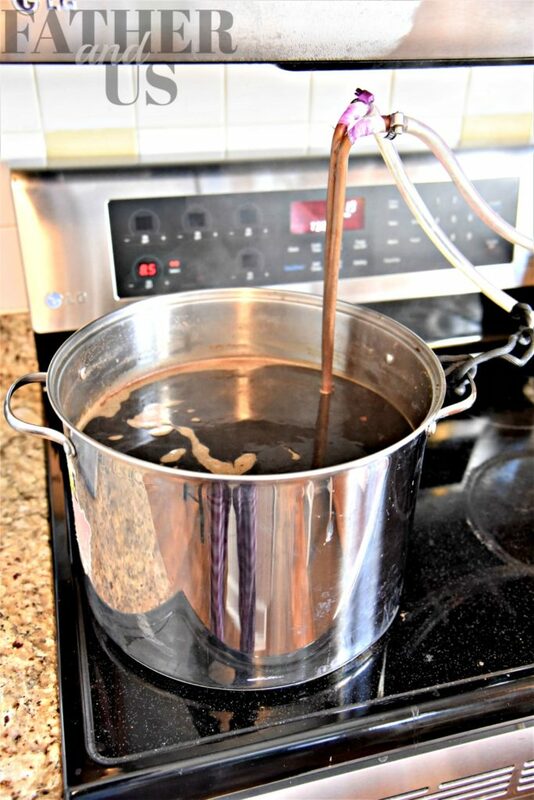 If you are just starting out at home brewing or if you are just a big fan of a nice English-style Porter beer, you have to try out this great Chocolate Porter beer recipe. It is a great beer recipe for beginners. Did you ever wonder what the difference is between a Porter and a Stout? I explain it all here! 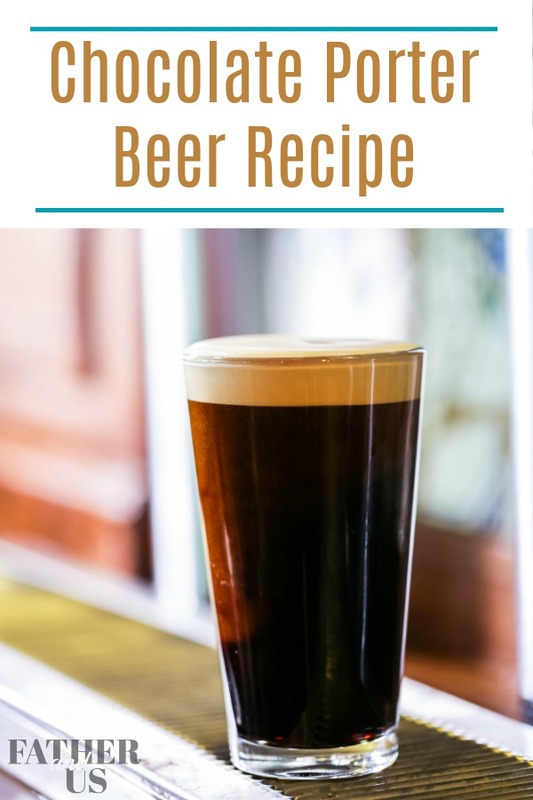 This is a great Porter beer recipe I have developed over the years. Other than the fact that it is a great beer recipe for beginners, I want to share it with you for several reasons. Porters, in general, are a very forgiving beer to brew. In fact, there is much debate about exactly what the difference is between a Porter and a Stout! Porters can go a lot of different ways and have several different profiles. 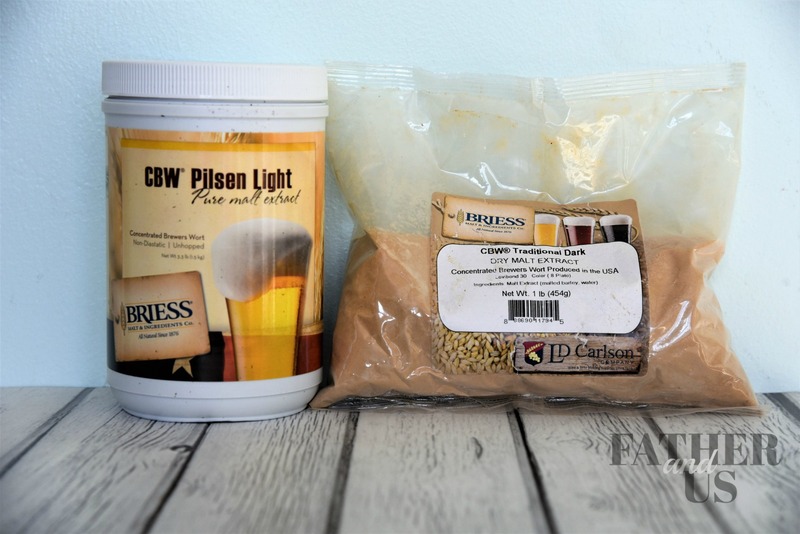 So, if you are new to home brewing, these beers are a great place to start. I have also discovered that Porters are a fairly crowd pleasing beer. Brewing 5 gallons of beer at a time is a lot to drink all by myself. So, it is important to create something that lots of others are willing to try. Sure, I love a super hoppy IPA, but…. my wife doesn’t, nor do any of her friends. There are still a lot of people out there that don’t like to venture too far away from a Coors Light. I think Porters are a great introduction beer for those just starting to get into drinking craft beer. It is a good lesson that “dark” beers aren’t always “strong” or “weird”. On the other side of this, beer snobs usually won’t turn their nose up at it either. So, in short, Porters are easy to brew, interesting and good to bring to a dinner party. The fist thing that I do is take my Carboy and fill it up with hot water and Star San. I will also take a large pot and fill that up with more hot water and Star San. In the pot, I throw some of the tools that I will need to keep completely sanitized. 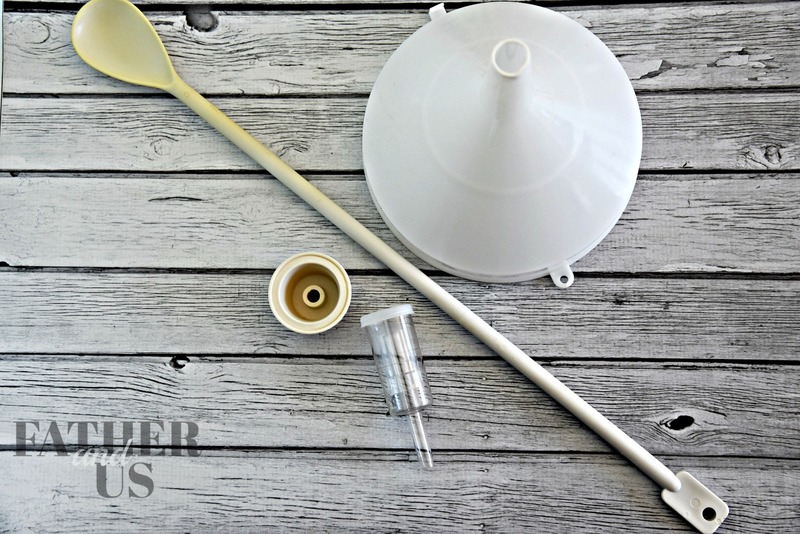 This is my stirring spoon, funnel, and airlock accessories. I also take my packet of yeast, which is always kept refrigerated, and set it out to get to room temperature. Don’t forget to do this! Next, I take my large, stainless steel brew kettle and fill it up with as much water as possible. What water should you use? Again, you can jump down the rabbit hole on the internet with people telling you what water they use to brew beer. My suggestion? Just don’t use tap water. I did that once. The beer turned out ok, but it certainly tasted like beer made with tap water. I just use the store bought two 2.5 gallon jugs of water. I am making 5 gallons of beer. I’ll actually need more than 5 gallons of water. Remember, this water will be steeping grains at 155 degrees and then boiling for 1 hour. So a solid amount of it will evaporate during this process. We always have some bottled water hanging around our house, so I just use this to top it off to get my desired gravity reading. The larger the brew kettle you can obtain, the better. This is especially true when using all grain recipes. 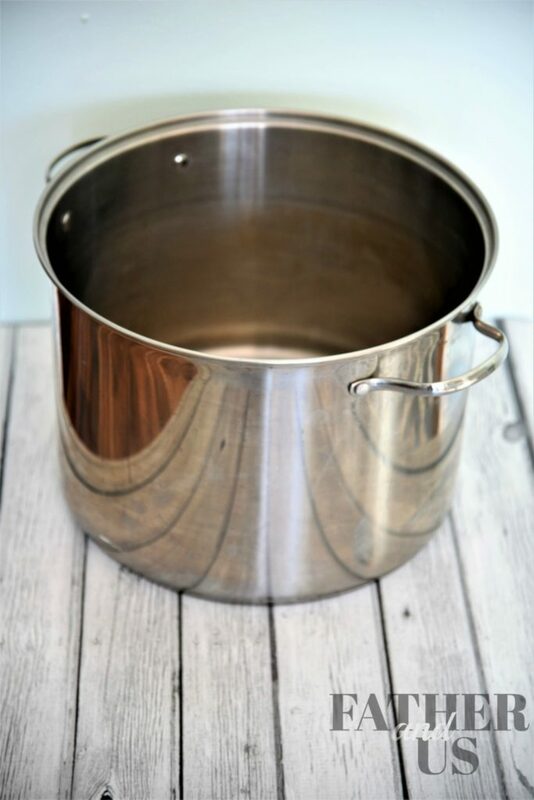 I use this 16 quart pot, and it works just fine. I am able to get about 3 gallons of my water in there to do a partial boil. Again, people will tell you that doing a full boil is better, and they are probably right, but this works for me. First, lets address sanitation real quick. At this point, yes, we want to stay as clean as possible and keep everything sanitized. That pot I made with warm water and Star San is great for you to dip your hands in to sanitize them as you are working. Also, getting a spray bottle with a mixture of water and Star San is awesome to sanitize on-the-go. But, at this point, we really don’t need to obsess too much about sanitation. Everything we are doing will be brought to a boil pretty soon, killing any bacteria that may have invaded our brew. It is after the boil and before it is safely in our air-locked primary fermentation carboy that we need to be extremely careful. I call this time, The Danger Zone. We are going to bring the water up to about 155 degrees. Not to beat a dead horse, but again, you can really overthink this stuff if you read too much about it. You will find treads online where people will debate endlessly about whether it should be 153 degrees or 167 degrees or.. whatever. I really want to keep this an easy beer recipe for beginners, so lets just says that I try to keep it around 155 and I’m always fine. You will need a thermometer for this stage. You really don’t want the water to get too hot. If it does, your beer with have a dry, “burnt” taste to it. I have made this mistake before. Not good. My thermometer is water resistant and I’ve created this little contraption to put it over the wort. Put your grains in a grain bag and steep them in the 155 degree water for 30 minutes. I tie the end of my bad to the handle of the pot to keep it off of the bottom. Please, make sure you are keeping an eye on your thermometer to stay at your desired temp. After 30 minutes, take the bag out and hold it over the pot to let the water drain out. Do not squeeze the bag, be patient and just let it drain for a minute or two. Once this is completed, go ahead and crank your temperature on the stove to get your water to a boil. 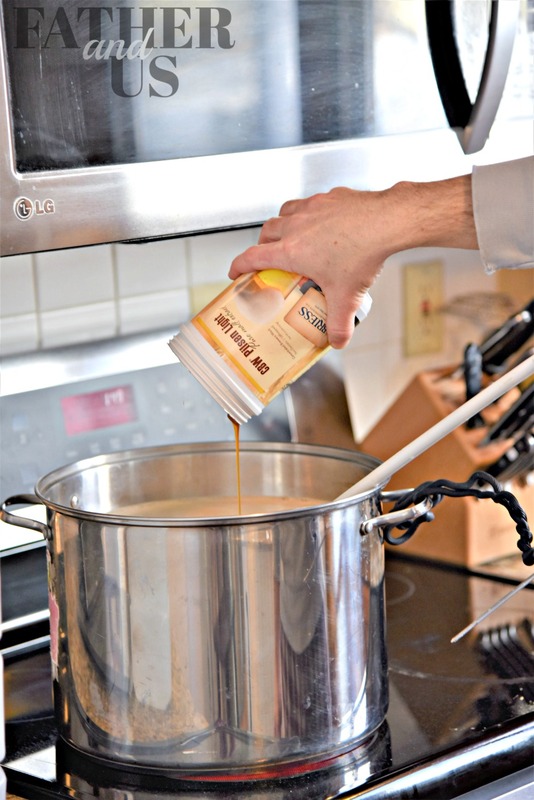 As the water is increasing in temperature, add your malt extract. Just open the containers and pour it in. Easy! Make sure you are stirring the extract in as you are mixing. We don’t want it to just fall to the bottom and start burning at the bottom of the pot. Also, when using liquid malt extract, I find it best to put the container in some warm water for a while. The extract will loosen up and pour out a little easier. This is another step that will require you to be on your toes a bit. We want to get our wort to a nice “rolling boil”. Make sure you do not let it boil over. This is 3 gallons of boiling hot, sticky water that will get all over the place. This is not something you want to happen. Trust me, I’ve gone down this road! Never again. Once the water is boiling, it is time to start the hop addition. Adding hops is really where the beer can get it’s character. Much of the flavor, bitterness and aroma is created in the next 60 minutes. There are a ton of hops that all do different things. 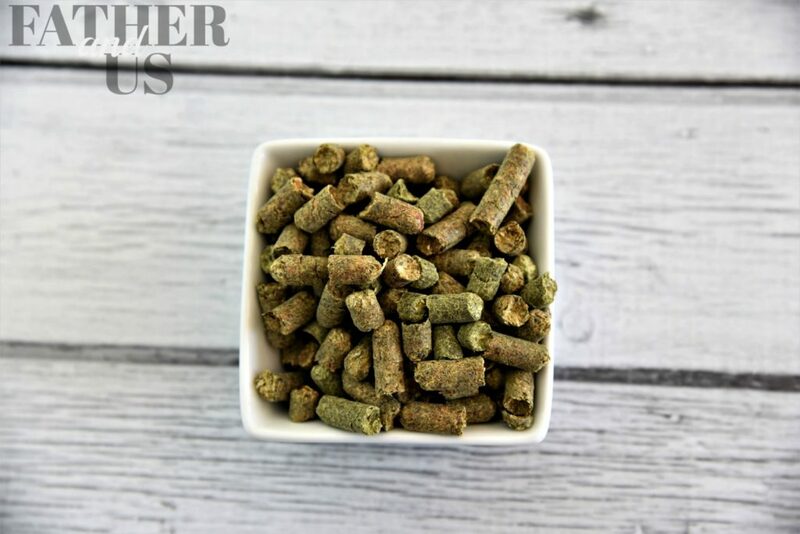 These are generally broken up into 3 categories: bittering hops, flavor hops and aroma hops. Some hops do all of these things. There are alpha acids and beta acids to consider. These are the things that really freaked me out before starting to brew on my own. I didn’t understand any of that stuff. Listen, there is a ton of info around the internet that will explain all of this to you. And, like a lot of things, you can make your home brewing world as big and complex or small and simple as you would like. I generally keep my operation small and simple. Another reason that this chocolate porter is a great beer recipe for beginners is that we are using one hop and one hop only. The Fuggle Hop. I am going to use this as my bittering, flavor AND aroma hop! So….. back to the boiling water. I have 2 ounces of Fuggle Hop pellets that I will put into it in the next 60 minutes. I put .75 ounces into the water at the top of the hour. Then, 30 minues later, another .75 ounces. Then, with 5 minutes left in the boil, the remaining .5 ounces. After we have completed our hour-long hop addition, it is time to ride into the Danger Zone. Chilling the Wort: The Danger Zone! At this point, we have our wort and it is completely finished. All that needs to happen in order to make tasty beer is for us to introduce the yeast and let it do it’s work for a couple weeks. But, before we do that, we need to go from a boiling temperature to about 70 degrees. Even though this is an easy beer recipe for beginners, this is still a pretty fragile process. The easiest way to do this is to use a wort chiller. I am a pretty cheap guy and didn’t want to invest in a wort chiller at first. My wife finally gave me one for my birthday a couple of years ago. These things are worth every penny. 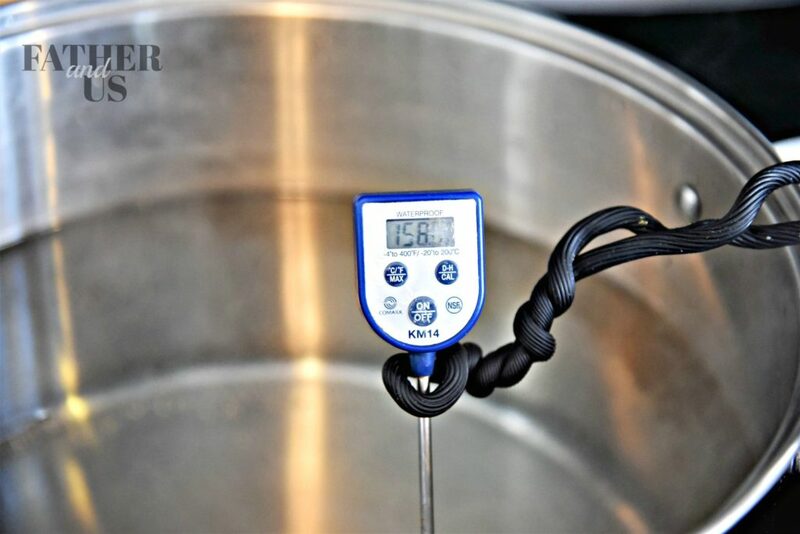 We need to cool our wort as quickly and safely as possible. Every moment that it is out in the world and not safely in it’s air-locked fermenter, it is at risk of being completely ruined! So, the quicker I can get it in the carboy, the better. With the wort chiller, I can do this in a fraction of the time compared to using an “ice bath” or other methods. An important thing to note here is that I put my wort chiller into the wort during the end of the boil. Why do I do this? Yep! That’s right. The boil sanitizes the wort chiller and makes it safe as we go into the Danger Zone. Once the wort gets down to around 70 degrees, use your sanitized funnel to pour it into the carboy. 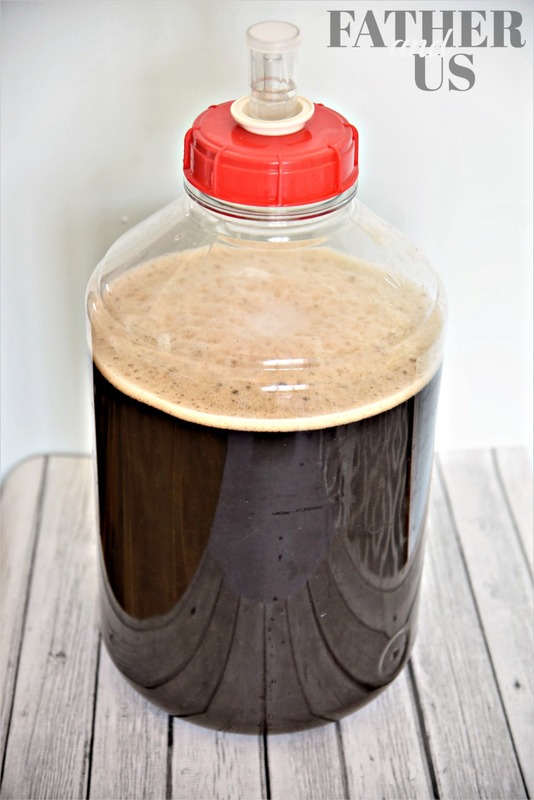 I use the wide mouthed carboy, it is easier to work with and easier to clean. Don’t worry about the wort sloshing around, right now, that is a good thing. We want it as aerated as possible for the introduction of the yeast. At this point, my 3 gallons of liquid has been reduced by about 1/3 due to evaporation. So, I’ll pour the rest of my 2.5 gallons of store-bought water into the carboy. From here, I’ll just need to add some more water to bring it up to 5 gallons. Many fermentation containers have measurements on the side so you know when you get to 5 gallons. Once I get to my 5 gallons, I pour the yeast in. Remember, at this point, our brew is VERY fragile. Sanitation is paramount right now. I put the packet of my room temperature yeast and put it into my bucket of hot water/Star San along with some scissors. I use the sanitized scissors to cut open the packet and pour the yeast in. After the yeast is in, I use my sanitized stirring spoon (spray bottle is great here) and stir it all up. Is Our Great Beer Recipe For Beginners Finished? Just about. Now I just put the cap on the carboy and insert the airlock. I fill the airlock with sanitized water. At this point, you may be asking me what my Original Gravity reading was. I have no idea. I didn’t take it. Yeah, I think getting gravity readings are important a lot of times. But not for my Porter, this is another reason it is an easy beer to make. It really is pretty forgiving. I’ll make sure I ferment it long enough it will be ready to go. I’ll take gravity readings on some of my higher A.B.V. beers like my IPAs and Imperial Stouts. But not for my Porter. Deciding where you want your beer to sit while it ferments is an important thing to think about. Some yeasts like to ferment at higher temps, some at lower temps. When you lager something, you need to keep it around 50 degrees! I have a couple different places in my house that are different temperatures at different times of the year. Right now (winter), my front hall coat closet is usually around 67-68 degrees. Perfect for my WPL004 Yeast! So, I just put it in the closet and wait about 3 weeks. After 3 weeks, I put it into a secondary fermentation container (bottling bucket) and wait about one more week. I generally don’t bottle my beer, I keg it. But putting my beer into this secondary container makes it a lot easier to keg, gets rid of the trub and gives me an opportunity to dry hop if I want to (I won’t be doing that for a Porter). All of this is probably worth another article. 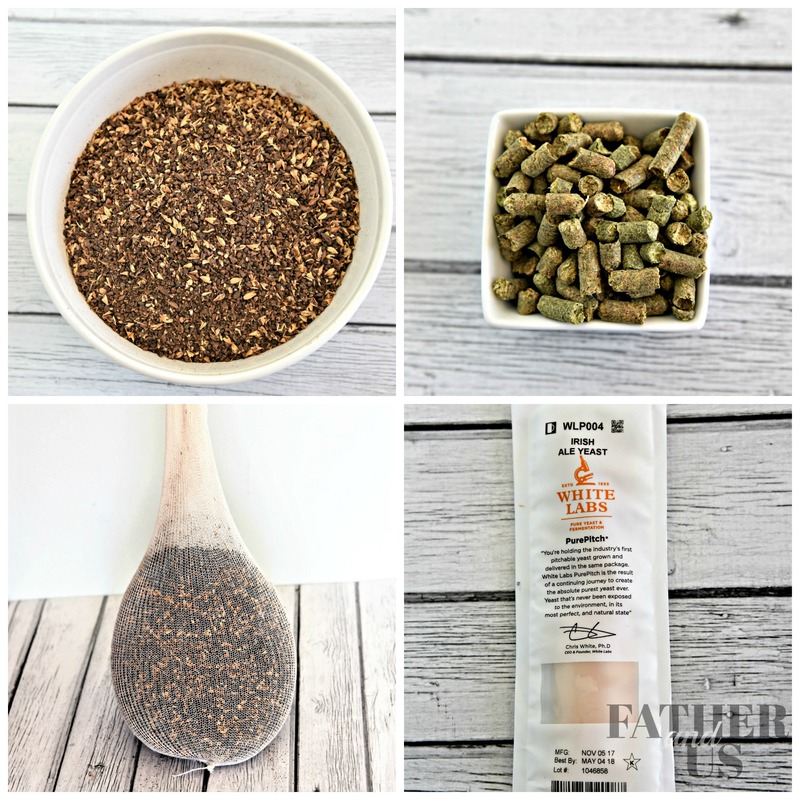 but I wanted to give those of you that have never brewed before a quick and easy beer recipe for beginners that a lot of your friends and family will enjoy. Cheers!